GooGoo is an 18 month old baby, cute, curious with a very rich inner world. 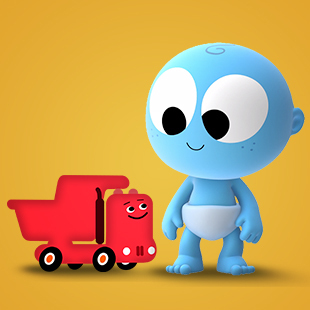 In each episode, GooGoo will encounter a funny blob friend that will “call” his attention, make him laugh and will then come to life and turn into a different toy vehicle each episode. The vehicles’ movements will make Goo Goo curious, happy, giggle and laugh out loud. Edited on a slow music, with rich soundtrack of baby’s giggles, cooing & laughter, “GooGoo” will meet both developmental & amusement standards of TV for babies. See what time GooGoo is playing!